This post is regarding the Superbowl, the biggest non-international event on earth. That's right, it is not even a blip on the ole' globe. Football is not very popular abroad, unless of course you are talking about Soccer. Which internationals call "Football", even in England and just everywhere else in the world. However, sometimes it's known as Footy too, but not to be confused with footsie... That is for another post. Professional Football and Life changing experiences. Being that I was born on the third coast between Chicago and Green Bay, I naturally am a football americano fan, follow the game, and even have my own end zone dance. So I feel it's right to make a prediction, first off, I think the Steelers are going to win. Have you seen the jaw on that coach, what is his name? Pittsburgh is backed by Big Ben, Bettis, and other people that seem to be good enough to give them a good record for the last few years. The Seattle Seahawks are my favorite however, and I want them to win. The reason is of course, they are the surrogate Packers. Same coach, same field general, what more do you need Beebe? Bono? or #92. the late, great, Reggie White? Besides, I think the Seahawks are due, I have been to Seattle, have seen Nirvana live, and love North-West culture and people. A Hawks win would really take me back to those days of Sub-pop records and deciding to start following football THE day that MVP Brett something publicly announced his Vicodin addiction. I thought to myself, "What a strong individual, I suppose since I am out of high school and am going to be working in a factory making snowmobile parts, I will have to have something to do, the Packers are it." So instead of finding out old and new record on Sundays, concerts, "raves", or trying to get BandBoo back together... I thought," I'm going to become a bone fide Green Bay Packer fan." And still am. Not many people except my closest friends understood my transformation. I went from a fella not knowing who was on the team, to a die-hard fan who claimed from game 1, "This is our year." Many friends, and those in my social circles weren't on the team bus at that point, would think I was joking about my authentic fevor for this: sports team("Football?, I thought you were cool, do you have a cigarette? "I quit. There are much bigger things happening now.") I religiously began following the Packers stats in the paper (Tivo and broadband weren't available, Google didn't exist, and thank heavens no fantasy football didn't either.... just good old fashion work pools, T.V. and grid iron football), their wins, and my finding out who was on this new found team of mine. "I will like the Packers and they will please me with many wins, and they are "Going all the way". They did. So luckily for me, the harsh winters spent in the Midwest were usually bearable by consecutive "Super Sundays" beating the Bears and 49ers over and over as payoffs from the pummeling they gave the Packers of my earlier years. 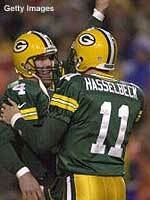 Every win felt like the Superbowl for a few years there, "The Pack" would kick teams all over the place. There are a few things that make them the embodiment of football in my opinion. #55 Ray Nitschke, Starr, Hourning, Majik, Longwell, Butler, Holmgren, The receiving corp,& #4 Favre. Well, if you retire Favre, and the Packers as I have known them come to and end. I will be both happy and sad: Thanks for that first TD pass to Rison in our last Super Bowl win, thanks for the momentum with the late great Minister of Defense Reggie White and that game where you threw for a bunch of touchdowns and 399 yard in the first half the day after your father died, and thanks for continuing to play after all the tragedies that have hit you and we have heard about. Thanks for winning that Superbowl in New Orleans and trying to get back to the big game ever since. It's nice to know that if you go, on the last day of your professional career you still had it in you to pick up an injurey addled and inexperience team to beat a team that made it to the Superbowl. So my biggest hope is that, I hope Favre's mentor and his understudy Hasselback, both bring glory to a new place that needs it, and perhaps the winters in Seattle will be a little more bearable, and the city of Detroit will enjoy revitalization after the game is over. I feel it ironic that Ford Field can put on a game and that compares to what they did in the seventies and continue to do now, cut jobs and sponsor sporting events. Anyway, this post is for the love of the game and nothing more. Go Seahawks and prove me wrong!